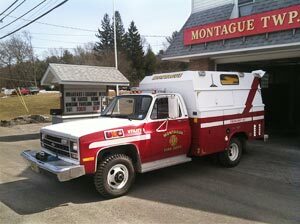 Apparatus | Montague Volunteer Fire Dept. 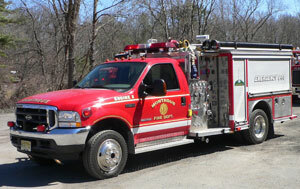 This truck is our main pumper. 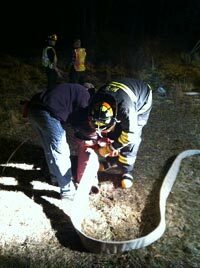 It can bring 6 firefighters and equipment (such as air packs, exhaust fans, hand tools, a generator & lights) to the scene. 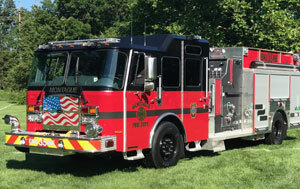 2017 E-One with a Typhoon cab, 2000 GPM pump and 1000 gallon tank. 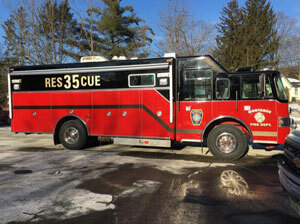 Engine 2 is much smaller than Engine 1, which makes it easier to maneuver into tight driveways. 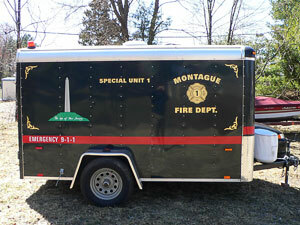 It can carry 2 firefighters, air packs, and various hand tools. 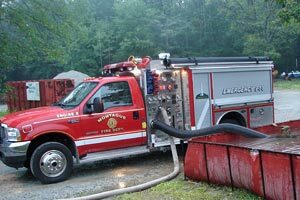 2003 Ford F-550 4WD with an E-ONE 1000 GPM pump, 250 gallons of water, and 30 gallons of foam. This truck hauls water needed for a structure fire. 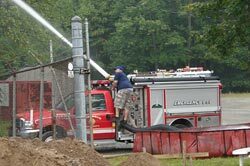 It has a "portable pond" to dump water into to feed a pumper while it goes to refill its own tank. 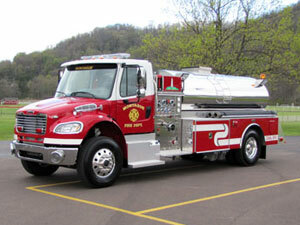 2012 Freightliner with Four Guys 500 GPM pump and 2000 gallons of water. This truck hauls water needed for a structure fire. It too has a “portable pond” that is set up on a flat area (usually the road) and it dumps the water into it to feed an engine (pumper) while it goes to refill its own tank. 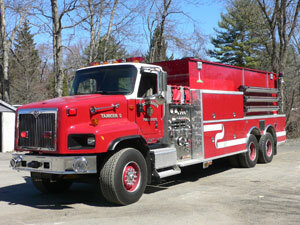 2006 International with KME 2000 GPM pump and 4000 gallons of water. 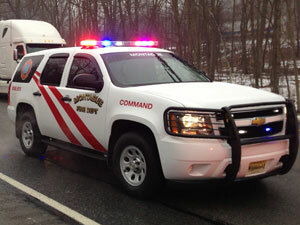 This truck carries equipment needed to pump out flooded basements, barricades to close roads, and traffic cones. It has a generator and lighting for night time operations. This truck carries specialized equipment, including six 6,000 PSI breathing air cylinders to fill air packs, extrication tools & equipment for motor vehicle accidents, a light tower, and some hazardous materials containment and clean-up equipment. 1995 Pierce Saber with 30KW PTO generator and 8 man cab. This truck responds to the scene first and gives the rest of the members an update as to the severity of the incident so they can prepare accordingly. It carries special radios and information specific to certain hazards we might face in our area, including hazardous materials and right-to-know information. 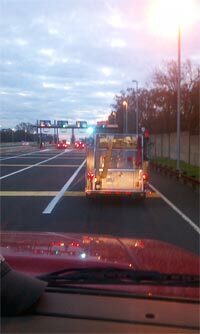 This truck is used to haul equipment back & forth to the scene. 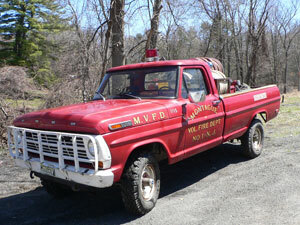 This truck goes into the woods to fight forest fires. 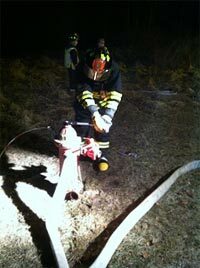 It hauls brush firefighting tools as well as water and a pump. 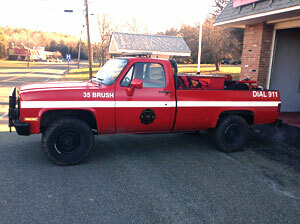 1986 Chevrolet with 300 gallon tank & Hale pump.